HOT DAMN PEOPLE! I really wanted to put that up in the post title but I thought that might interfere with search engine optimization purposes. Best to just stick with the title. But seriously HOT DAMN CAN YOU BELIEVE THIS THING IS IN MY HOUSE???!!! Happy early Christmas and future birthday present to me! Ok let me really catch up the people who aren't TOTALLY OBSESSED up to speed. 'Pioneer Girl' is the annotated (omg so annotated! so many notes! so many details!) 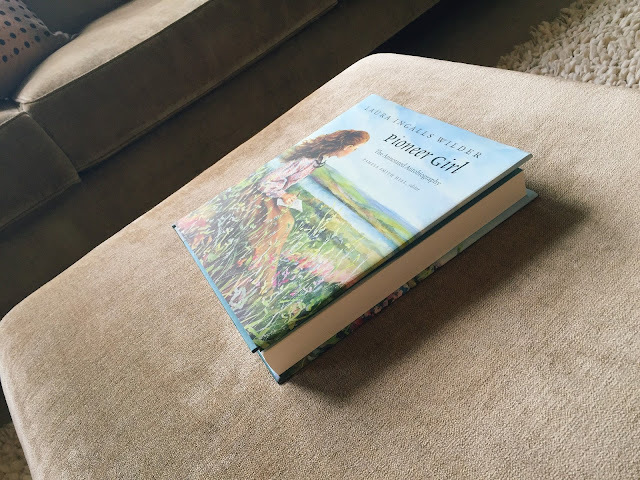 autobiography of Laura Ingalls Wilder. 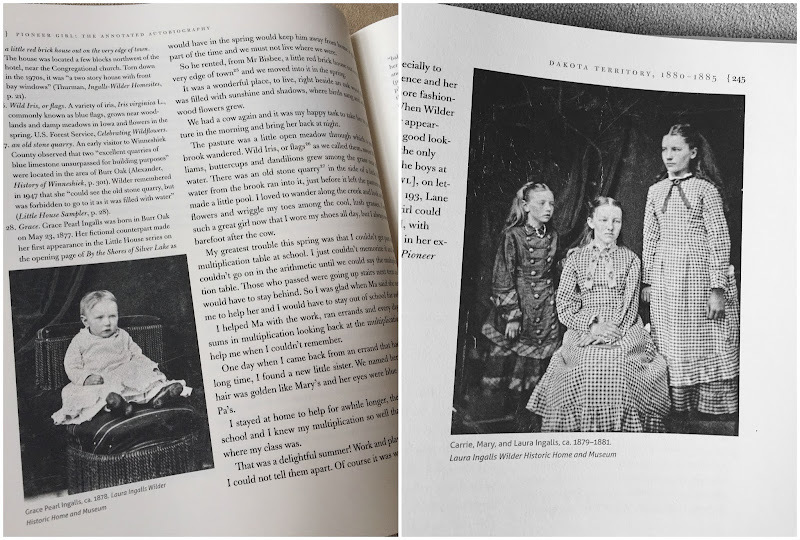 It contains large portions of Laura's unedited early drafts of the books, (and there are tons of type written letters showing the crossed out revisions from her daughter and editor, Rose Wilder). Worst sentence ever, please forgive, I'm very excited. 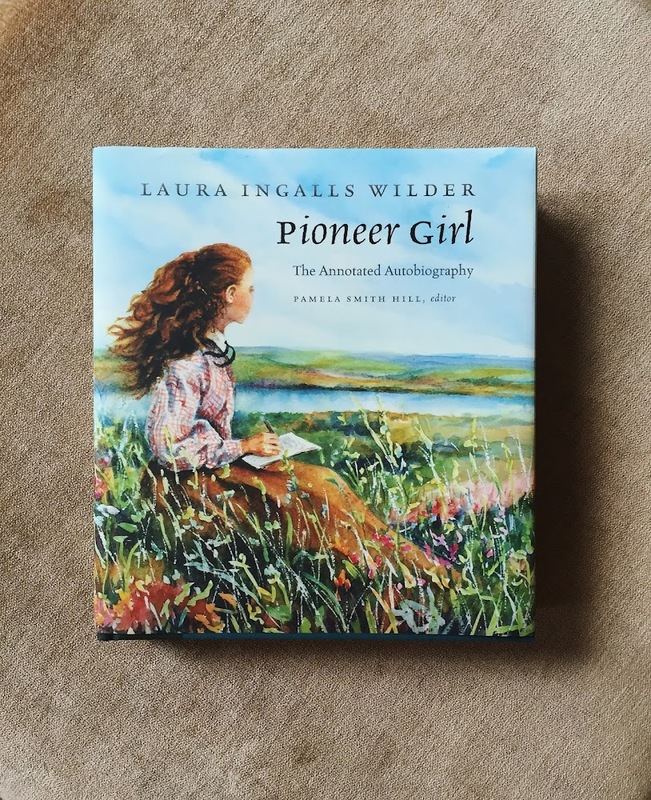 'Pioneer Girl' has never-before-published details from the stories that did not find their way into the books, because some nuggets were Just Not Appropriate for children's books. (like people lighting themselves on fire and whatnot) It has backstory on the Ingalls and Wilder families, it has details on the history of the time, and on the history of the real life counterparts to many of the book characters (Laura's arch enemy, Nellie Oleson, was based on TWO girls - the teen 'Nellie' was actually named Genevieve. Laura spells her name as 'Genieve' but apparently it was 'Genevieve'.) 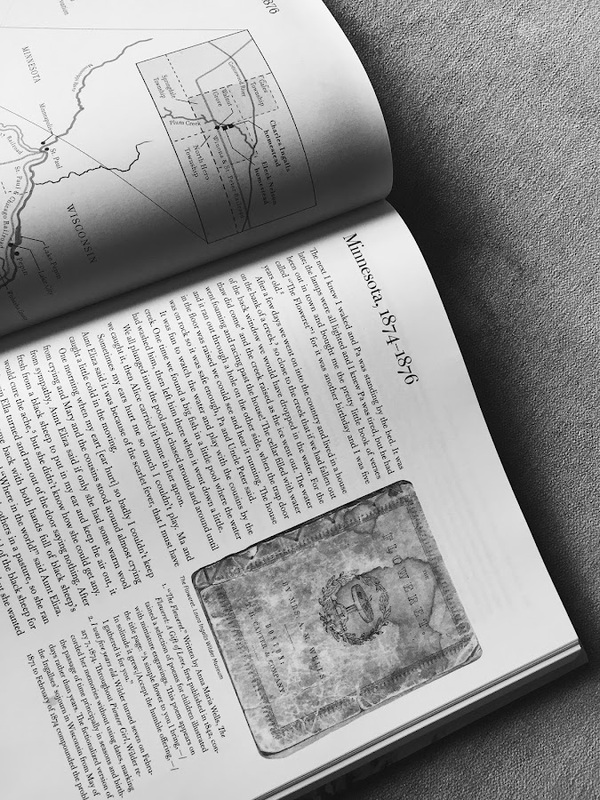 It has pictures and photos of the real life places described in the book. 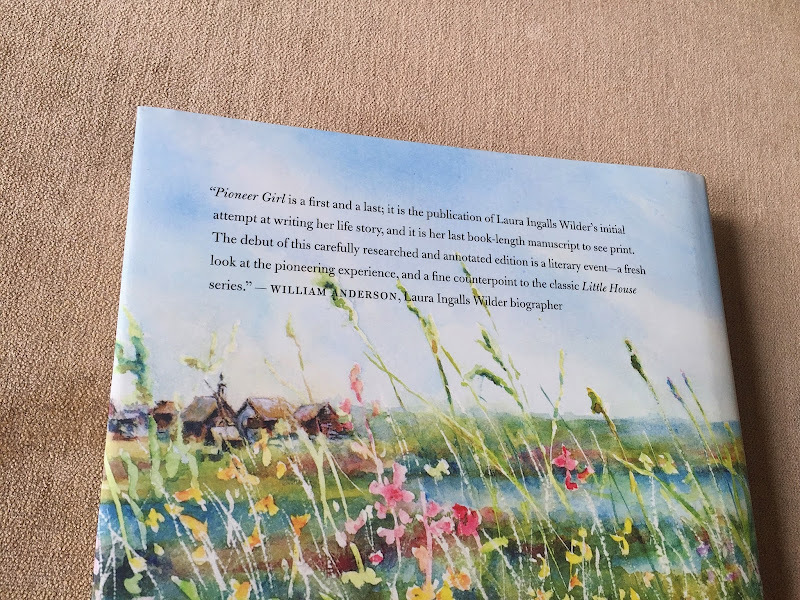 It talks and talks and TALKS (and this is a GOOD thing) about the behind-the-scenes Real And True happenings - details and incidents gleaned from Laura's writings, personal letters, diaries, unpublished manuscripts - all meticulously distilled into coherency by Laura's biographer, Pamela Smith Hill. The level of research that has gone into this thing......I just can't even wrap my brain around it all. 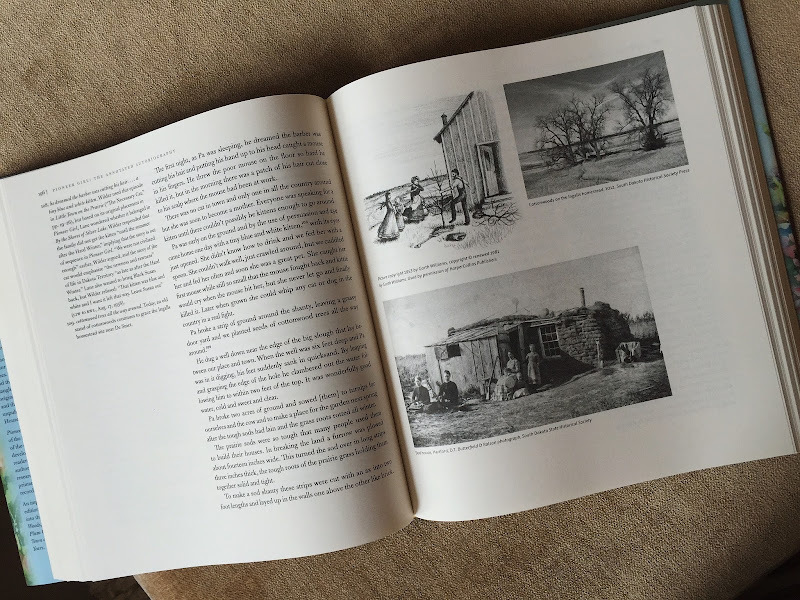 The book is broken down by area and time period (like, 'Dakota Territory, 1880-1885') and then the original drafts of story are inserted with annotation after annotation. Did you know Laura wrote in the first person? That was all changed for the final versions of the books, in which Laura is referred to as 'Laura' in 3rd person narrative. 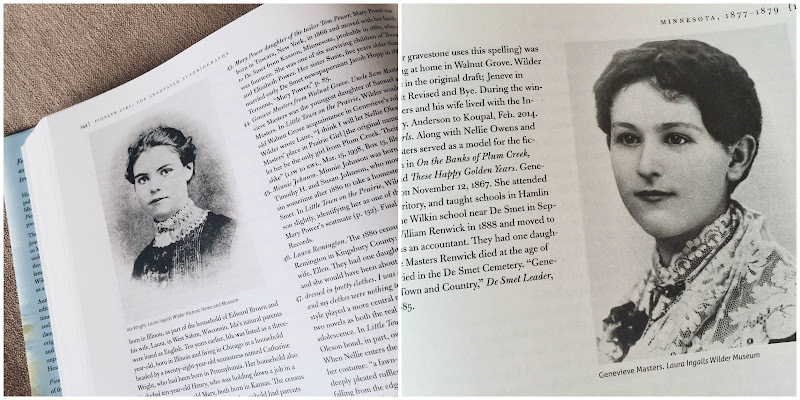 Remember the part in 'Little Town on the Prairie' where Laura and Carrie have Almanzo's sister Eliza Jane as their teacher and what all went down in that classroom, when Eliza Jane made Carrie rock the seat? I have to tell you - I PREFER THE UNEDITED VERSION - that Laura had such a temper!! LOVE IT SO MUCH. That epic face-off between Laura and Eliza Jane sounds a bit more intense than the version presented in the books, let me tell you. And Laura and Genevieve! (aka, Nellie Oleson) - oh my stars, Laura really and truly HATED her. The real versions of the story discuss how much. Genevieve called Laura 'fat' to her face, while Laura told Genevieve that her feet were too large (ARE YOU DYING WITH LAUGHTER??) and that her clothes were old hand-me-downs. 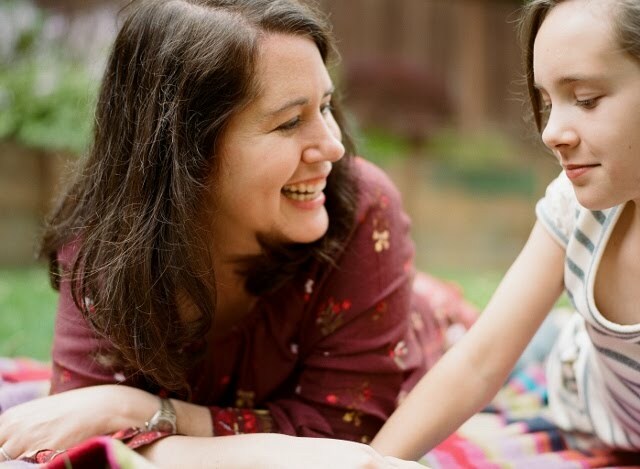 There are so many details to Laura's original writing that are just amazing to read. I can see easily why such details were tossed out of the final versions of the books though - a lot of it is Laura rambling about various things that don't really push the narrative of the storyline forward - when you read her rough draft writing, you can really see clearly how heavily the books were edited into the creations that they are. Rose Wilder was a genius. 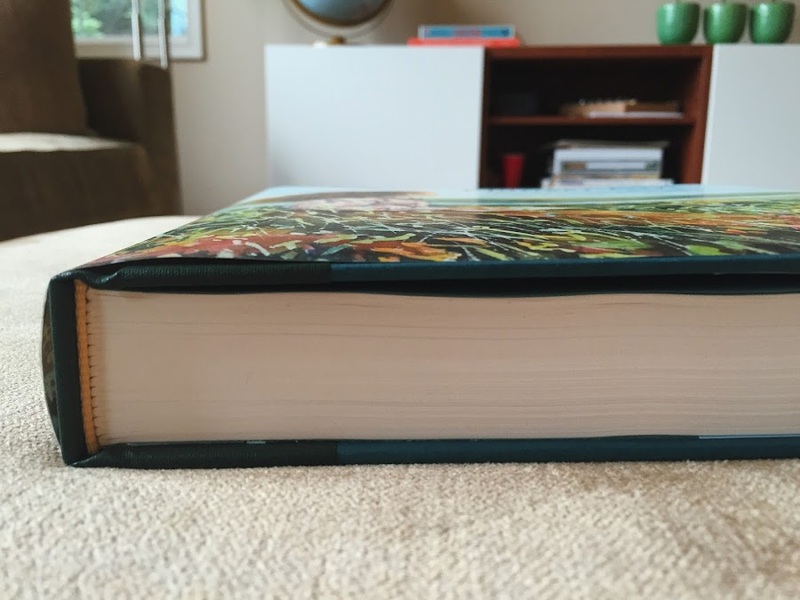 I haven't even begun to skim the surface of what's in this book - it's HUGE, coffee table sized. I'm going to be poring over it for years, most likely. There are photos, and maps, and so much to discover in it - it's the ultimate 'Little House on the Prairie' treasure box. 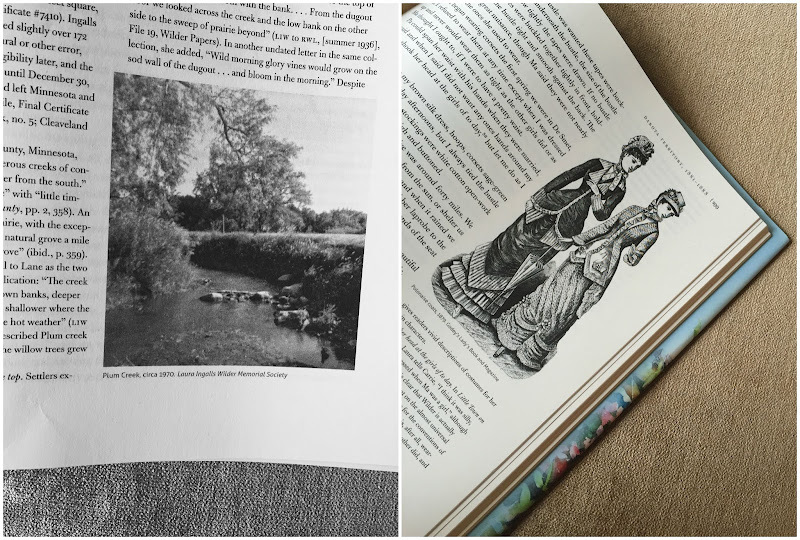 Now some of you might know that this book was very much a labor of love on the part of the publishing company - not many copies were created of the book initially, and it sold out in a heartbeat. I tried to get it last holiday season to no avail. NO ONE had this book. I found it in an independent bookstore a few weeks ago when we went to Lake Chelan in Eastern Washington - there's a remarkable little bookstore there and they flipping had it. I shrieked when I saw it - and turned to the bookstore owner and yelled at her "YOU HAVE IT!" and she started laughing at me. I turned to Andrew, who was already shaking his head in dismay, after seeing the size of the thing - and was like, SORRY MY FRIEND, CHRISTMAS JUST CAME EARLY FOR ME, THERE'S NO WAY I'M LEAVING WITHOUT THIS BOOK. But guess what, cookies - 'Pioneer Girl' is back in stock at Amazon, and for a good $15 less than I paid for it. At $31, this is a STEAL of a price for a book of this beauty, size, and complexity. GO GO GO before it sells out again! I'm just a little excited. OMG! I guess I got really lucky because I got this and read it a while back. And I concur with everything you say! All the Burr Oak stuff really is harsh. Eesh. Enjoy enjoy enjoy! I was waiting for you to write a review about this. I didn't know you had such a hard time getting your hands on it! I have heard about Laura enemies (Nellie and Genevieve) but this is obviously a lot more detailed. The scene with Eliza Jane/Laura/Carrie in the book was already tense enough LOL I wonder how Laura eventually looked past Eliza Jane when she decided to marry Almanzo. Now I am curious to know the other secrets! I will get it eventually though (because I just spent a bunch on other books this week so not quite yet)! I always wondered about that as well - wouldn't that have been pretty awkward, that whole Eliza Jane thing and then marrying her brother? Weird! I am dying to get my hands on this thing. I have always known there was a lot about the story that was edited out to make it palatable for children. But I never knew WHAT. Now I can. 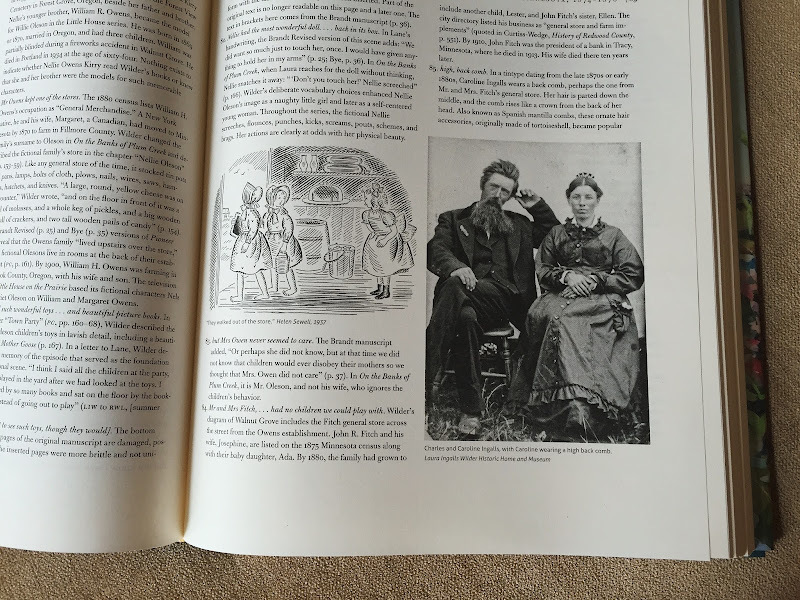 And I was reading a while ago about Ursula Nordstrom, editor at Harper and Row and Laura Ingalls Wilder is listed as one of the authors she edited (as well as EB White, Margaret Wise Brown, Shel Silverstien, and Maurice Sendak. She was a fascinating woman. ), so Rose must not have been her only editor. It was Nordstrom's idea for the reprint editions of the novels, with Garth Williams's illustrations. Do read Dear Genius sometime, if you haven't already. Her letters are amazing. yes yes!! Bringing Garth on board was thing that really pushes these books into True Greatness, in my opinion. Thanks for the heads up-just placed my order! So excited to get this! Watermark Books in Wichita has had a ton of copies since it came out! I asked for it for Christmas and Mother's Day. I think Big Sis is making her daddy go birthday shopping for me this weekend. HA! I really want to read that 'Ghost in the Little House' book or whatever it's called - haven't read that one yet. Happy birthday in advance and I hooooooooooooope you get the book!! !